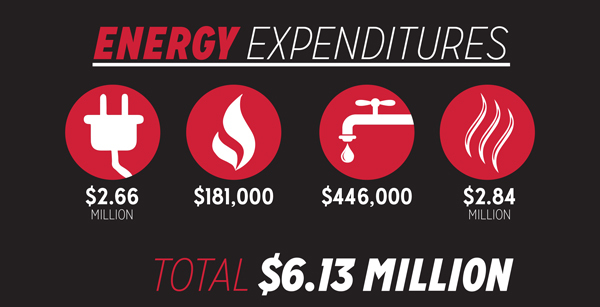 During fiscal years 2012-13, YSU spent a total of $6.13 million on energy. The university has taken initiatives to cut back on energy consumption. After a blow to the university’s total revenue due to decreased enrollment and reduced state funding, Youngstown State University has a compelling reason to take further steps to conserve energy. “Over the past five years or so, we’ve really embraced [energy conservation] for a couple of reasons,” said John Hyden, director of university facilities. “One, it’s good for the environment, and secondly, it’s important for us from a budget standpoint to save as much energy as we can. The cost of energy keeps going up. For fiscal years 2012-13 the university spent $6.13 million on energy — spending $2.84 million on steam, $2.66 million on electricity, $446,000 on water and $181,000 on natural gas. Bill Haas, director of engineering at the facilities office, explained that YSU has a contract with EnerNOC, a company that gives YSU an incentive to curtail energy. Just for participating in EnerNOC’s curtailment program, YSU will receive $38,000 this year. The university will then get paid an additional $1,000 per saved Megawatt-hour. For this fiscal year alone, YSU has avoided an estimated $168,000 in electrical charges. “Companies like EnerNOC are able to ask customers to save. They pay us to reduce the energy. They then sell the energy back,” Haas said. Five years ago, YSU entered into a performance contract with Johnson Controls, a company that also guarantees the university savings. Their initiatives have saved the university roughly $1 million per year. The office of facilities has also made regular, day-to-day repairs that save energy. They have replaced mercury vapor lighting in Beeghly Center and Stambaugh Stadium with energy-efficient, fluorescent lighting and have installed LED lighting in the M2 parking deck in order to save on electricity costs. decrease in the university’s cost of operations. Hyden also said that energy conservation leads to compromised comfort. Michael Orto, manager of the facilities office, agreed with Hyden. The office of facilities has received complaints for their conservation of energy. Energy saving initiatives have particularly affected professors conducting research in Ward Beecher Hall. David Asch, professor of molecular and microbiology, said it takes money to run these freezers. The office of facilities acknowledged that they have received complaints. Haas added that the office of facilities cannot solve every problem. “We can’t control everything that’s going on in every room across the entire university. There are things that are going to happen,” Haas said.